USAF Senior MSGT Ejected for Reference to 'God' There has been yet another example of Barack Obama’s top-down effort to eradicate any reference to faith by military personnel. MSGT Chuck Roberson invited retired Senior MSGT Oscar Rodriguez Jr. to conduct a traditional flag retirement as part of Roberson’s own retirement ceremony on April 3rd. Despite the fact Rodriguez has served at Travis Air Force Base for almost 30 years and is well known there, when he arrived at the building for his colleague’s retirement gathering of family and friends, he was met by thuggish maintenance (not security) personnel. Those three senior non-com personnel, an E-6, E-8 and a Chief Master Sergeant E-9, were under orders from base command to expel Rodriguez if he used a retirement script which referenced “God.” I have spoken with Rodriguez, and assure you he didn’t make the rank of Senior MSGT because he was a pushover. 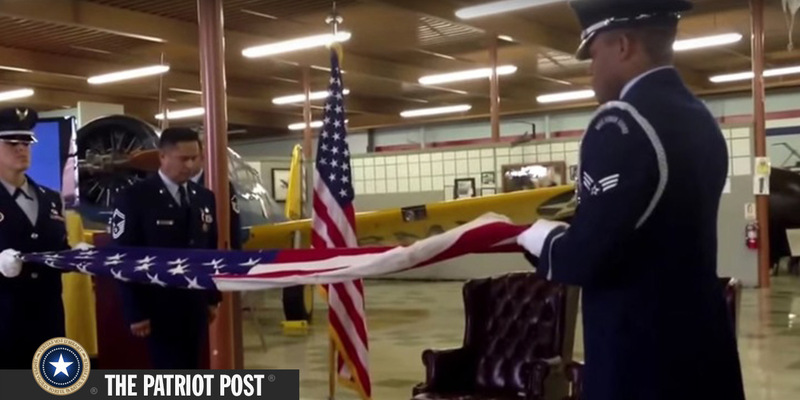 When he stood for his part in the ceremony — in civilian clothing we note — and began his flag recitation, he was confronted by the maintenance personnel (as seen in the video below), and forcibly removed from the ceremony. This brutish removal did not just disrupt the retirement ceremony, it horrified the non-military spouses and children present. Once outside the building, Rodriguez was then shoved around by three other non-security personnel, at which point base security arrived. They advised Rodriguez to leave, but not before he insisted on pressing charges against those who ejected him, and he is filing formal complaints. According to Lt. Col. Robert Couse-Baker at Travis AFB, the Air Force “respects and defends the right to free speech and religious expression.” But he added, “Rodriguez ignored numerous requests to respect the Air Force prescribed ceremony and unfortunately was forcibly removed. We will continue to investigate the situation fully.” In other words, despite Couse-Baker’s assertions to the contrary, Rodriguez was removed for exercising his First Amendment “right to free speech and religious expression” as a citizen and guest at a voluntary retirement ceremony. Notably, Rodriguez told me that he made the appropriate inquiries up the chain of command to inquire about the delivery of his recitation – and received no response. The USAF has modified its regulation AFI 34-1201 for official flag-folding ceremonies, to cleanse it of any reference to faith, but Rodriguez was present as a civilian – raising serious legal questions about his removal. http://patriotpost.us/posts/41933 Entire article, has videos.